Poinsettia’s are available for purchase to grace our Sanctuary for the Christmas Season, please contact the Church Office at (812) 372-4555) or pick-up an order form on the table in the back of the Sanctuary. Each poinsettia is $13.00 and can be made in honor or in memory of a loved one. Donations to the Asbury Music Fund may also be given. Poinsettias will be available to take home after the Christmas Eve Service. 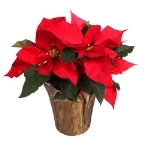 We have 8 poinsettias available, so make sure you place your order right away.